Thank you for your interest in the Child Life Internship Program at Maria Fareri Children’s Hospital, member of the Westchester Medical Center Health Network (WMCHealth). A child life internship provides a poignant beginning in every specialist’s professional journey. 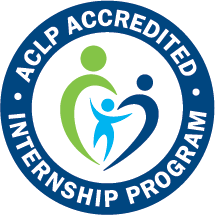 Our internship program is accredited and recognized by the Association for Child Life Professionals (ACLP). We offer a 600-hour child life internship (40 hours per week, over approximately 15 weeks) twice a year. Internships start in August and again in January and are designed for college seniors and graduate students pursuing careers in child life, child development, early childhood education or other fields with a child development emphasis. Applicants must be enrolled in a college or university at the time of application and during the internship. If you are selected as an intern, your college or university must negotiate a contract with WMCHealth before the internship starts. The internship includes a one-week orientation, and two six-week clinical rotations. One rotation is in medical/surgical general pediatrics; the other is in critical care. The internship schedule varies depending upon rotations; some evening, weekend, and holiday coverage is required. During the program’s final two weeks, interns will shadow child life specialists in areas that are not part of a planned rotation. Interns are supervised by certified child life specialists meeting all Association for Child Life Professionals eligibility requirements. Interns meet weekly for one hour with their rotation supervisor and internship coordinator respectively. Through hands-on clinical experiences, interns receive multiple skill-building and educational opportunities in medical play, psychological preparation, charting, planning and supervising developmentally appropriate play activities, working within a multidisciplinary team, family centered care, family support, prioritizing needs and developmental assessment. The internship, designed to complement academic studies, is based on Association for Child Life Professionals Standards of Academic and Clinical Preparation Programs in Child Life, Child Life Competencies, and current Child Life Certification Committee recommendations. Currently pursuing an undergraduate or graduate degree in child life, child development, human development and family studies, psychology or a closely related field. Enrolled at a college or university at the time of application and during the internship. Must have at least 100 hours experience with Well Infants, Children, Youth and/or families. (e.g. nanny, counselor). Must have at least 100 hours experience with Infants, Children, Youth and/or families in Healthcare Settings (e.g. volunteer). Must have completed or currently in the process of completing a minimum of 100 hours of practicum experience, under supervision of a Certified Child Life Specialist (CCLS). Successful completion or currently in process of completing 10 college courses in the following content areas: Child Life Course Taught by a CCLS, Child Development Courses, Family Systems Course, Play Course, Loss/Bereavement or Death/Dying Course, Research Course, and 3 additional courses in related content area. Completed and signed Common Child Life Internship Application. Completion of 10 college courses in the following content areas: Child Life Course Taught by a CCLS, Child Development Courses, Family Systems Course, Play Course, Loss/Bereavement or Death/Dying Course, Research Course, and 3 additional courses in related content area. If you are currently taking one or more of the above courses please also submit Confirmation of Child Life Course In-Progress Additional Required Courses Form. Description of the applicant’s college or university academic requirements and the role of the college or university supervisor. Verification of at least 100 hours experience with Well Infants, Children, Youth and/or families. (e.g. nanny, counselor). Verification of at least 100 hours experience with Infants, Children, Youth and/or families in Healthcare Settings (e.g. volunteer). Verification of at least 100 hours Child Life Practicum experience hours. If the child life practicum is in progress: Confirmation of Child Life Practicum In-Progress Form. 300- to 500-word essay describing your interest in child life. Three letters of recommendation, each accompanied by a Candidate Common Recommendation Form. These can be from a professor, supervisor or another professional who has directly observed your work with children. One letter of recommendation and a recommendation form must be from your Child Life Practicum Supervisor. Recommendation letters must be written in paragraph form and must address specific knowledge and skills relative to your work with children, parents, and professionals. Letters of recommendation must be on business letterhead and submitted in sealed, signed envelopes. Recommendation forms must be submitted either in the same sealed, signed envelope as the letter of recommendation, or in a separate sealed, signed envelope. Maria Fareri Children’s Hospital follows the internship application, offer and acceptance dates set by the Association of Child Life Professionals (ACLP). Please submit all application materials in one envelope. It must be received by the application deadline set by the ACLP. Mail-delivery confirmation to the applicant by a postal or mail service is recommended to ensure timely delivery. Incomplete and late applications will be returned to sender. An application is not a guarantee of interview or acceptance. After review of submitted applications, applicants may be contacted for an in-person interview. Selection of interns is based on academic preparation, experience working with children in healthcare settings, knowledge of child development, letters of recommendation, child life experience and an interview. Before final acceptance, applicants must be successfully cleared by the Maria Fareri Children’s Hospital Occupational Health Department and a criminal background check. Both are arranged and paid for by the hospital. An applicant’s participation also is contingent upon a college or university affiliation agreement. Failure of any of these stipulations will result in withdrawal of the internship offer. A hospital orientation must be completed prior to the internship.